CASE STUDY CONCEPT: Timeless Supply Chain Challenges (inventory, location, transportation, and the bullwhip effect). Imagine it is the year 210 A.D. and you are the head of the largest merchant trading house on the Silk Road. The long prosperity of the Pax Romana has created strong demand in the Roman Empire for the luxury products you import from China and India. Chief among those products is silk. Everybody who is anybody wants their clothes made of silk. Along the length of the Silk Road stretching from the borders of the Roman Empire in the west to the Middle Kingdom (China) in the east, there are many cities and many merchants, yet all know your company and your name — you are the Merchant Trading House of Barmakid, in the city of Merv. The Silk Road was approximately 4,000 miles (6,440 km) from its start in China to its end on the shore of the eastern Mediterranean. This compares with 2,440 miles ( 3930 km) between New York and Los Angeles, and 1,760 miles (2,830 km) between Paris and Moscow. Your city of Merv (3) is the largest city on the Silk Road (https://en.wikipedia.org/wiki/Merv). It sits at the main crossroads that connect the road’s starting points in China (1) and India (2) with its end point in the Roman Empire on the shores of the Mediterranean Sea (4). There is great desire in the west to have the exotic goods of the east. And the most widely desired of those goods is that marvelous fabric called silk. It is beautiful to the eye, smooth to the touch, light in weight and very strong. How it is made is a mystery, only the Chinese know that, and they carefully guard the secrets of its manufacture. You also trade in other fine products to enhance the enjoyment of life. There are jewels to delight the eye, spices to tantalize the palette, medicines to heal the body and substances to sooth the mind. These are the products that are carried on the Silk Road. They are high in value, and smaller in size and weight than common commodities of daily life such as grain, leather, wood or woolen cloth. It is this combination of high value, small size and lightweight that makes it profitable to transport such products over long distances. During all but the coldest months of the year, there is a steady stream of caravans and exotic merchandise flowing from east to west on the Silk Road. And coming back the other way the caravan owners carry gold and silver coins exchanged for their silk and precious goods, and other products to sell in the cities they return to. Along the length of this road cities have prospered because of this trade. The city of Xi’an (1) is where the Silk Road starts. It is the city where the first great emperor of China built his capital. His walls were strong and his army (1A) was unstoppable; he united much of China under his rule. This is the place where silk and exotic merchandise is gathered and loaded onto caravans to start the journey to the west. Note the regular street grid and the large square moat that surrounds the entire old core of Xi’an. The size and layout of the city shows the builders had great resources and a disciplined workforce. The other source of exotic merchandise is the cities of India to the south. The Indian city (2) of Indraprastha (Delhi) on a tributary of the Ganges River is the place where spices and jewels and other products begin their journey north and west. The cities of India in many cases still occupy sites where people have lived for thousands of years even though most traces of the older cities are gone. Delhi occupies a site on the banks of the river where Indraprastha once stood. The central meeting point on the Silk Road is the city of Merv (3). It is the place where the many different routes of the Road become one. The city was founded by Alexander the Great in the year 330 B.C. on his campaign through Persia and Afghanistan and beyond. Even then, this was where the ancient trade routes converged; that is why Alexander chose this place. There was already a small city surrounded by round walls (3A) that you can see inside the straight walls of the Greek city. The city has been ruled by Greeks, Parthians, Persians and Arabs. Over the centuries it grew in size and splendor. The main warehouses (3B) that hold the Barmakid inventory are located inside the walls of the old Greek City (once known as Margiana Antiochia), later overshadowed by a much larger city (3C) that came to be known as Merv. The site of Merv is now abandoned. It prospered for more than a thousand years and grew to become a city of a million or more people. Then in 1221 it surrendered to Tolui, son of Genghis Khan, and he massacred its inhabitants and burned its buildings. It is hard to say where the Silk Road ends because there are always merchants who buy the products and sell them to others even further west. Yet one could say the Silk Road ends in the city of Palmyra (4). It is a city of wealthy merchants on the eastern frontier of the Roman Empire. That city is located in the biggest oasis between the Euphrates River and the city of Damascus. Beyond Palmyra lie the cities of Damascus, Tyre and Antioch where the products imported on the Silk Road are exported to the rest of the Empire. Many of the cities on the Silk Road were fortress cities protected by strong walls that can still be seen today. In addition to Merv and Palmyra, walled cities such as Bukhara, Bactra, and Kunduz are shown below. A big risk that comes with large amounts of valuable inventory is the risk of raiding tribes and bandits. It takes lots of money to build and maintain the walls, and pay the soldiers needed to keep raiders and bandits from carrying off the merchandise. The Silk Road depends on a hardy animal called the camel. No other animal can carry the cargo it carries and endure the hardships it endures. On the roads to the east of Merv the camels with two humps (Bactrian camels) are most common, and to the west, it is the camels with one hump (Dromedary camels) that are most common. Each kind of camel is best adapted to the climate they encounter on their part of the Silk Road. The double humped camel can survive both the heat of the eastern deserts and the cold of the high mountain passes. The camels with one hump are better in the relentless heat and dust storms of the western deserts. Without these unique animals to transport products through such harsh lands, there could be no Silk Road. To the east of Merv, the routes are especially challenging and unpredictable. The Silk Road splits into northern and southern routes to cross the great Taklamakan Desert and the high passes of the Tian Shan Mountains before they arrive in Merv. The desert routes follow the best paths from one oasis to the next. In the pictures below you see how the routes follow the streams and rivers (fed by melting snow from the surrounding mountains). Cities grew up in the big oases where the caravans stop to rest and refit. Travel times between the oasis cities are 10 to 20 days because camels and people cannot journey much longer before needing to rest and replenish their food and water. Woe to the caravans that lose their way in a storm, or fail to follow the landmarks properly. They are never heard from again. These cities are also places where caravan leaders can sell their products to local merchants and return to their cities of origin. One way to manage the risks inherent in a long journey on the Silk Road is to specialize in just one or a few shorter routes between certain cities. The prices you can get for products increase the further you go from the origin points of those products, but costs and risks also increase the further you carry those products. So you balance the risks against potential profits. In the picture below, Merv is marked with an orange circle where different routes converge. It makes sense for those routes to converge on this large oasis because such an oasis can grow a lot of food and feed a lot of people. So a big city can grow there. And because it is where the different routes converge, this city can exert considerable influence on the operation of that supply chain called the Silk Road. Looking to the west from Merv, you see a similar pattern. Again the cities are 10 to 20 days travel from each other until Palmyra. At Palmyra the routes split again with one going south to Damascus and Tyre, and the other going north to Antioch. These cities in turn become the starting points for other supply chains within the Roman Empire that supply the northern and southern shores of the Mediterranean. In meetings with caravan leaders, and countless conversations with other merchants, travelers, priests and soldiers, you are forever gathering information about conditions on the Road and prices and supply and demand for different products. You work at developing an intuitive sense for opportunities and risks. And as you sense what is happening, where supplies are running out and where they are building up, you see possibilities and business opportunities. In the next article of this three-part series, “Taming the Bullwhip on the Silk Road” we explore how the Silk Road was organized and operated so as to maintain a predictable flow of products from one city to the next. And in the final article, “Taking Care of Business on the Silk Road“, we investigate how prices were set and how inventory was managed. We use simulations of the supply chain model presented here to try out different options and see what works best. That reveals a lot about the probable inventory management and supply chain practices on the ancient Silk Road (HINT: those practices were surprisingly modern). Import a copy of the ancient Silk Road supply chain model from the library into your account. Then open the model in your edit screen and explore the model. Let this article guide you in your exploration; zoom in on the cities and locations mentioned in this article and turn on the satellite view and look around. See how the facilities and routes are influenced by the constraints imposed by the terrain through which the Silk Road travels. Turn on the “Terrain” option under the Maps view to get a better look at the terrain and note how facilities and routes follow the terrain. Form a mental picture of the terrain and the cities along the road. Notice how the Silk Road routes connected cities and followed rivers and the topography of the land (modern roads still follow essentially the same routes). Click on the “Simulation” button in the upper right corner of the edit screen and open up the simulation screen. When the simulation screen opens, click on the “Play” button in the upper right corner of the screen (you might want to set the speed of the simulation to “Fastest” because this is a big supply chain model and it can run slowly). Notice vehicles (camel caravans) moving between the cities on the Silk Road. Zoom in and look at the cities and click on the city names in the display menu on the right side of the simulation screen. Notice how the inventory levels of the different products fluctuates from week to week and from one city to the next. The time scale of the model has been modified so each day represents a week – daily demand and production rates at facilities are multiplied by seven to be weekly rates and vehicle speeds are seven times faster than for a daily model (see more about this in the “Timeline” section of Tips for Building Supply Chain Models). In week 19 of the simulation a problem will arise and cause the simulation to stop. Click on the city names in the display menu on the right side of the screens. Try to get a mental picture of how the different products are flowing through the Silk Road supply chain. It’s hard because there are so many different cities but do the best you can. 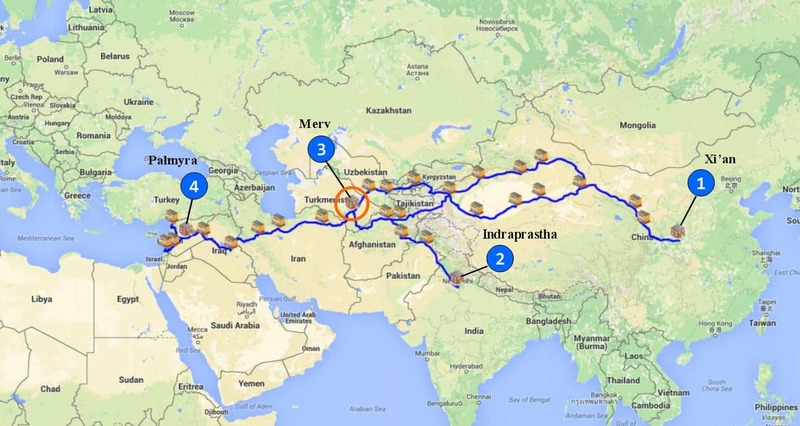 Summarize what you learn about the structure of the Silk Road and the flow of products along the Silk Road in a short presentation using screenshots and data from the model to illustrate your findings. SAVE BACKUP COPIES of your supply chain model from time to time as you make changes. Click “Save” button next to your model in Account Management screen. There is no “undo”, but if a change doesn’t work out, you can restore from a saved copy. And sometimes supply chain model files (json files) become damaged and they no longer work, so you want backup copies of your supply chain to restore from when that happens. Now advance to the second part of this case, “Taming the Bullwhip on the Silk Road“. Your challenge there will be to organize and operate the Silk Road so as to maintain sufficient inventories and flow of products to meet demand in all the cities. There is a spreadsheet reporting template you can use to analyze downloaded simulation data. Import your simulation data into the template and create profit & loss reports as well as generate key performance indicators. See more about this in the online guide section “Analyzing Simulation Data” – scroll down to the heading titled “Download Simulation Data to Spreadsheet Reporting Templates”. The sample template is set up for the Cincinnati Seasonings company, but look at how the reports read the simulation data and you will see how to change the spreadsheet as needed to accommodate this case study. Register on SCM Globe to gain access to this and all other case studies. Click the blue “Register” button on the Log In page (app.scmglobe.com) and buy a subscription (if you haven’t already) using a credit card or PayPal account. Then go to the SCM Globe library and click the “Import” button next to this case study. Scan the “Getting Started” section (if you haven’t already), and you are ready to go.